For those who travel light, choosing a projector is an act of compromise. Trading lumen output for light weight and low fan noise while maintaining a reasonable price is a balancing act, and finding a projector to fit all your needs is not always simple. With the release of the appropriately named TraveLight2 by Boxlight, things just got a little easier. This little XGA projector packs 2100 ANSI lumens into a 2.5 pound package that is surprisingly quiet. What's more, this portable powerhouse can be yours for current street prices of around $1500. Light Engine: 1024x768 (XGA), native 4:3 0.7" DLP chip, 156W VIP lamp. 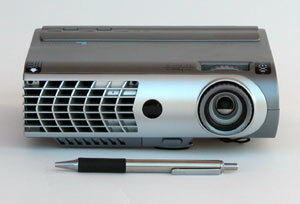 Video Compatibility: HDTV 1080i, 720p, 576p, 576i, 480p. NTSC/PAL/SECAM. Data Compatibility: Computer resolutions up to SXGA (1280x1024). Connection Panel: One DVI-I port, one combo composite/s-video minijack, one mini-USB port, one 1/8" audio-in port, Kensington lock point. Lens and Throw Distance: 1.16:1 manual zoom/focus lens. Throws a 100" diagonal image from 12' to 13.9', or a 60" diagonal image from 7.2 to 8.3'. Lamp Life: 4000 hours, 5000 hours in eco-mode. Warranty: Two years, 120 days/500 hours for lamp.